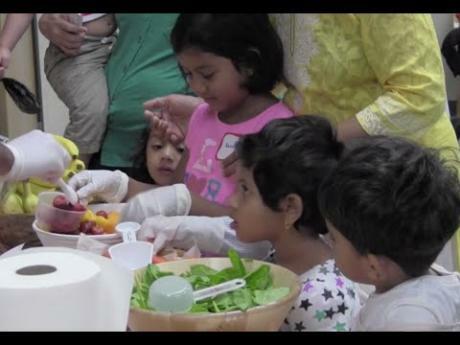 See the video about Santa Clara County’s First 5 Childhood Obesity Prevention Program here. And all of the CSAC Prevention and Early Intervention videos will be posted to this YouTube play list. California Counties are focused on preventing problems and intervening in issues before they become more serious. All during the month of October, CSAC is profiling California County programs that typify the concept of Prevention and Early Intervention. We are writing blogs, and presenting videos that show how some Counties are putting the concept of Prevention and Early Intervention to work. We were inspired in this effort by Contra Costa County Supervisor John Gioia, who chose Prevention and Early Intervention as the theme for his term as CSAC President. Teaching kids under the age of 5 to like their vegetables isn’t easy. In Santa Clara County they decided the earlier the better and through their First 5, Childhood Obesity Prevention Program, they are making fruits and veggies fun and tasty. And the benefits accrue not just to the kids and their families, but to the county and the community as well. It’s easy to see obesity as an individual problem. It is up to each person to decide what they eat. Or, is it? If you live in a “food desert” where there are more fast food joints than grocery stores, you’re more likely to eat fast food than a home cooked meal. If you’ve never seen how food grows in a garden, you’re not likely to think very much about where your food comes from. And conversely, if everyone around you eats well, you are also more likely to eat well. That’s the concept behind the program in Santa Clara—and yes, they start young—with kids in their first five years of life. At the Northwood Family Service Center in Santa Clara County, kids and their parents learn about healthy food choices. They have a garden so the kids can help plant, harvest and eat the food. The instructors have been known to put on vegetable costumes to help focus short attention spans. The kids get to help mix up strawberries, bananas and a little juice with spinach and kale in a blender to make smoothies that are tasty, healthy and homemade. And they dance, play, sing and jump to get some physical activity that doesn’t involve thumbs on a keypad. It’s hard to measure the impact of this program. It’ll be 10 or 15 years before today’s toddlers are making their own decisions about what to eat, and how much activity they need. But the negative consequences of obesity for kids, families and counties are well documented. Obesity leads to higher rates of diabetes, heart disease, hypertension and other serious medical conditions that reduce quality of life and productivity, and cost money to treat. Spending a little money now to give kids and their families some additional tools to fight obesity just makes sense. So, pass me the kale and let’s fire up the blender. We may be a few years past the “First 5” stage, but, it’s never too late to start eating healthy! And Santa Clara County’s program is showing us the way! Gregg Fishman serves as Communications Coordinator for the California State Association of Counties.